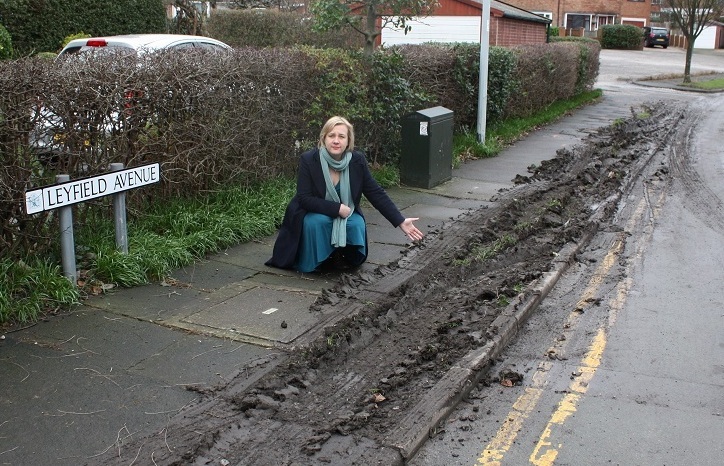 Leyfield Avenue residents who went out early this morning and left a grass verge at the end of their road will return this evening to find a ditch in its place. This morning, the driver of a large wagon attempted to find a route which didn't involve using Stockport Road (the height restriction on the railway bridge made it impossible for him to go that way) and got stuck in Leyfield Avenue. Driving into and reversing from Leyfield into Guywood Lane over the grass verge has left it in a right state as you can see in the photo. Lisa Smart said, "The grass verge no longer exists. A muddy ditch now lies in its place. I've been straight onto the council to get it cleared up as soon as possible and am looking into ways to stop this from happening again. "